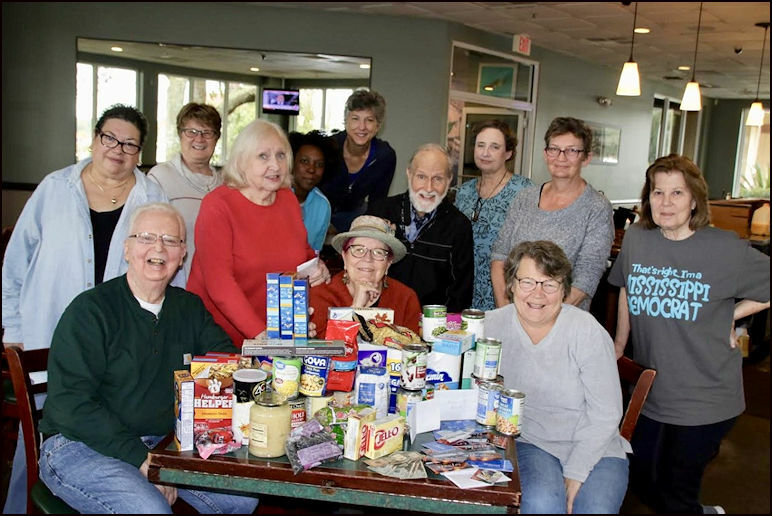 The Jackson County Democrats Breakfast Group in Ocean Springs sponsored a drive for food, grocery store gift cards, and cash to donate to Feeding the Gulf Coast, formerly Bay Area Food Bank. Feeding the Coast serves a 24-county area spanning south Alabama, south Mississippi and the Panhandle of Florida. Feeding the Coast has begun to work with its community partners and agencies to identify and fill any gaps in the food supply. The Jackson County Democrats Breakfast Group collected $1,000 and 76 pounds of food on short notice (under one week!) and transferred the items and funds to Feeding the Coast. While the shutdown has ended, those whose lives were impacted may still need help. If you are interested in joining the Democrats for breakfast, we meet at McElroy’s on the Bayou in Ocean Springs on Tuesday mornings at 8 am. For information, contact Connie Moran at (228) 219-1699. This impressive donation is a powerful demonstration of how the Jackson County Democratic Community is putting our Democratic values into ACTION!! Exciting things are happening! Check out our Events! Help us Achieve our Goals by contributing to the Jackson County Democratic Executive Committee. We are united in our effort to elect Democratic leaders of character, integrity, and vision We are committed to be the change our state needs to deliver real results for Mississippi citizens.